Our range of products include steel hand rails, modular railing system, railing system and railing accessories. Our handrails can be easily fitted by all, from professional builders to D.I.Y beginners. You can choose from indoor or outdoor installation with choices of tube diameters and preferred design from Tapered, Domed, Flat and Multi-groove end caps. In our broad collection of various products, we are also offering a qualitative gamut of Modular Railings System. Offered product is designed and manufactured with utmost care using finest grade raw material in rune with set industry standards and norms. The heavy-duty Aluminium profile is anchored onto the wall of the RCC parapet. The railing glass is fixed to the wall profile by special metallic pins. The cover profile provides a neat finished appearance. Heavy-duty frameless glass wall-mounted railing system without verticals. Designed to resist high wind-pressure and live loads without compromising safety. Easy to install – dry fixing – without silicon sealants. Low maintenance of easy cleaning and glass replacement. Can be installed inside or outside of a building (with scaffolding). Cover profile available in powder coated, color natural anodizing, wood-imitation finish. 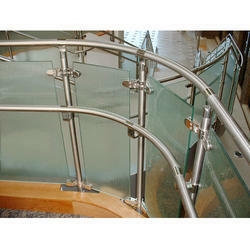 We are offering trade and supply client an excellent quality range of Railing Accessories. These Railing Accessories are made from very high quality stainless steel which ensures optimum quality at its client end. These products are available in various designer patterns and different designs. 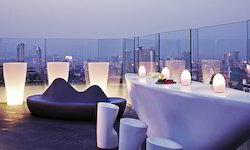 These Railing Accessories are widely known for its high durability, great quality and high appearance.